Some characteristics of a good employee include being conscientious, wanting to succeed, appreciating the opportunity and being honest about their qualifications and experience. It turns out these qualities apply to employees of all kinds whether you are of the human and feline variety. When cats arrive at the Dumb Friends League, they receive a general health examination, spay/neuter surgery, microchip ID, Felv/FIV testing, age-appropriate vaccinations and a rabies vaccination before becoming available for adoptions. During the evaluation, if a cat shows no inclination to be with people, they are enrolled in our Working Cats program. Patrons looking to adopt a working cat must complete our standard adoption application and meet with an adoption counselor to find a good match. All adopters must agree to provide warm shelter, food, water and regular veterinary care. 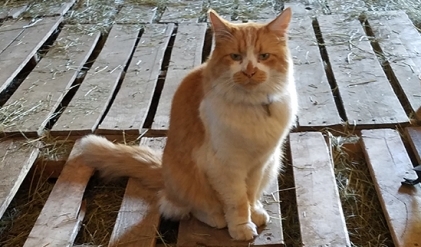 Semi-feral or feral cats that come to our shelters with histories or temperaments better suited to an outdoor lifestyle can live in a barn, stable or an outdoor setting where they have a “job,” as well as a better quality of life. Each year, the League strives to increase adoption numbers for participants in the Working Cat program. Since the program began in 2012 through early May 2018, 1,692 cats were placed. Cats that are not candidates for the general adoption population now can thrive in a different type of environment. Learn more about our Work Cat program at ddfl.org/workingcats or call our Customer Care team at 303.751.5772.